Fran Musselman passed away on April 3, 2013. Fran Musselman has died. 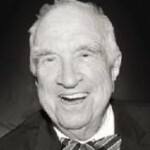 He was a member of the Greatest Generation in every sense of the term, not only for his World War II military experience, but also as a founder of the Economics Section of the American Bar Association. Fran took a special interest in me and my solo practice and shared many valuable insights that helped me become a better and more efficient lawyer. As our friendship developed, visiting in each others homes added another dimension to our relationship. He was a wise mentor to me and to dozens of others. With his passing, the world in general and the legal profession in particular have lost one of the last great gentle men. Fran was a product of the state of New York, but he had none of the rough edges some people associate with Easterners. He exuded charm and was the consummate host. In fact, Fran was courtly. You could be pretty sure that when you saw him, he would be wearing a bow tie—not a clip on like I would need–but one that he himself had tied. You also could count on the welcoming smile and the look on his face that made you believe that he had something up his sleeve besides his arm. Fran was a founding member and the fifth person to chair what then was known as the Economics Section of the ABA. He was devoted to the Section and worked tirelessly to help it formulate and establish long range goals to become the national source of help to introduce lawyers to the benefits of operating efficient practices. In those early years when the Section was struggling financially, it was rumored that he was using his own funds to keep it afloat. His greatest contribution to the Section was his ability to identify and motivate the best of the volunteers and to get them to “buy-in” to the vision. Although more deserving the limelight than most, Fran let others get the glory. To use a term that is popular today, Fran embodied the concept of servant leadership. Fran was a big firm lawyer at Millbank Tweed Hadley and McCloy who rose in the ranks to become its managing partner. Along the way, he developed expertise as an insolvency lawyer. With this background and with his practical approach to law practice, he was a natural to handle the bankruptcy of Finley Kumble, another large New York firm. It was one of the first big firms to explode and it took Fran the better part of five years to untangle the mess. When Fran chaired the Section, Shep Tate was president of the ABA. Shep had an interest in practice management and committed the ABA to provide more support to the Section. The two of them got together with numerous members of the executive staff and arranged for a special pull out section on practice management in the March 1979 issue of the ABA Journal. It was written by members of the Economics Section whose pictures graced the cover of that issue. It was a showpiece for the Section and a marketing piece for the ABA and since a copy was sent to the last known address of every lawyer in America, it offered an introduction to more efficient law practice to a wider audience than could have been imagined..
That support and that mailing operated as a catapult for the Section and provided much needed momentum and credibility for its work. In my opinion, the Section might never have stabilized or been able to continue for so many productive years without it. Fran was a “go to” person whose integrity and leadership were shared with his own firm, the Section, and those of us fortunate enough to serve with him. He brought to the Section those characteristics along with much wisdom, experience, good judgment, and an incredible knowledge of how to practice law. Goodbye, old friend. I am only one of many, but I will miss Fran Musselman. I am certain that I will recall his countenance and that it will stir up treasured memories of Fran each time that I see someone wearing a bow tie.